The management of invasive species in Washington State is limited by the fact that existing data and information regarding these species in the state are not centralized, making it difficult to evaluate the current status and potential future impact of these species, and to coordinate management programs. There are a diversity of organizations working on physically controlling and establishing policy for invasive species. Despite some cooperation between these entities, significant gaps exist in communication and coordination across counties, between public and private lands, and between state, federal, tribal, and county lands. As a result, there are disparities in the quality and quantity of data on invasive species, and with few exceptions, neither single species nor multi‐species data are gathered in one place accessible to managers or data collectors. 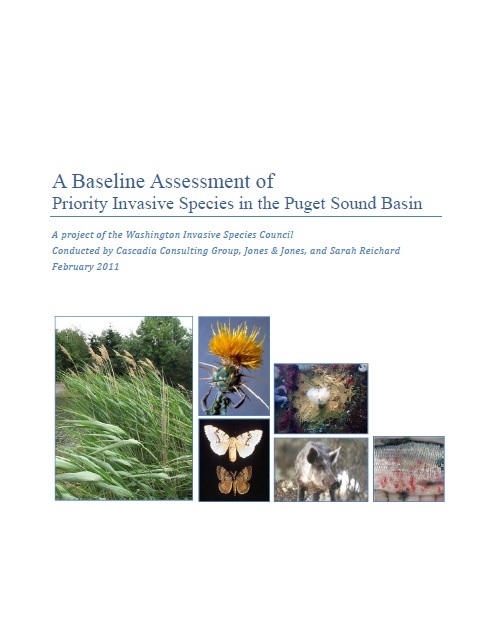 The Washington Invasive Species Council’s 2008 strategic plan “Invaders at the Gate” found that these challenges make it difficult to “fully define the scope of the invasive species problem, as well as the state’s capacity to measure its progress…to combat them.” The Council recommended, as a top priority in the short term, to “compile existing information and conduct a baseline assessment of invasive species information and programs in Washington.” This report is a pilot response to this recommendation, focusing on just 15 priority species within the Puget Sound Basin only. This work should begin to inform coordination of a statewide, strategic response to invasive species that uses limited resources effectively and focuses on the greatest ecological need and potential benefit to native ecosystems and the human systems that depend on them.